Every once and a while a cookbook comes along that sort of revolutionizes the way I cook/bake in my kitchen. Dorie Greenspan’s Baking: From My Home to Yours helped me become a better baker and now Pam Anderson’s latest book, Perfect One-Dish Dinners is assisting me in the cooking department. Like you, I’m crazy busy. Between teaching, blogging, photographing, and writing, sometimes I barely have the brain power or the energy to nuke a hot dog. Yes, I do eat microwaved hot dogs; don’t judge me. However, Perfect One-Dish Dinners has taken the guess work out of cooking. Pam’s book will assist you with meals for those cozy, quiet evenings at home, but will also help you pull off an amazing dinner party with stellar results. This giveaway is now closed. Winners have been contacted via email. Thanks so much to those of you that entered. 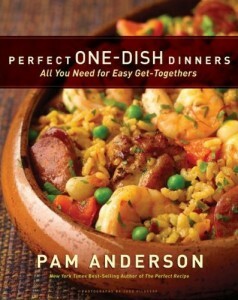 Perfect One-Dish Dinners is a collection of accessible meals based around the one-dish main course. Pam creatively includes appetizers, sides, desserts and wine pairings to complement each of the One-Dish Dinners. From Osso Bucco with Dirty Polenta to Silky Chocolate Flan, I’m certain this cookbook will have something for every occasion. I have made six recipes from the book and all of them have been absolutely delicious. My favorite being the Sausage and White Bean Cassoulet, it’s simple and incredibly tasty. I had the pleasure of meeting Pam and her amazing daughters, Maggy and Sharon, on a recent trip to San Francisco. Let me tell you, they are pretty fantastic…humble, adorable and hilarious. The three of them collaborate to write the witty and scrumptious blog, Three Many Cooks. Definitely check them out on Facebook and Twitter for all things delicious. Last night I made Pam’s hearty Pork Stew; served alongside a warm baguette it was the perfect dinner to warm us up on a dreary fall day. 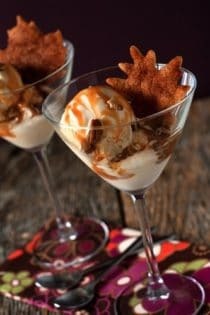 We ended our meal with these decadent Pecan Pie Sundaes…they have all the flavors of pecan pie without all the work. And since I am such a HUGE fan of this book, I am giving two away and sharing a recipe from my Sunday Supper. Today 24 food bloggers are banning together spread the word about Perfect One-Dish Dinners, so definitely click through the links below to experience all kinds of deliciousness. -Leave a comment on this post and tell me your favorite Sunday Supper recipe. It can be something old school or a modern twist on granny’s classic casserole. -Want more chances to win??? Each item you do will get you ONE chance to win (for a total of 3 chances), if you ALREADY do any of these things, they DO count! So make sure to comment for each item! You MUST leave each entry as a separate comment or only one comment will count! -For one more chance to win, like Three Many Cooks on Facebook. 2.) One winner will be chosen on 10/29/10 by using random.org. 3.) I will contact the winner by email using the email address provided in the comment form. 4.) Winners have until 11/2/10 to claim the cookbooks. 5.) Book will be sent directly from Amazon. 1. To make caramel sauce, bring 1 cup sugar and 1/4 cup water to a boil over medium heat in a medium heavy-bottomed saucepan, whisking constantly. When mixture starts to boil, turn heat to medium-low and stop whisking. Continue to boil until mixture turns golden brown, 10 to 15 minutes. Remove pan from heat and whisk in 6 tablespoons butter and molasses. When butter has melted, whisk in cream. Cool to room temperature. 2. Adjust oven rack to lower-middle position and heat oven to 375 degrees. Line a baking sheet with a Silpat baking mat or parchment paper. 3. Mix remaining 2 tablespoons sugar with cinnamon in a small bowl. unroll pie dough and place on baking sheet. Brush with remaining 1 tablespoon melted butter and sprinkle with cinnamon sugar. Cut dough into 12 triangles with a pizza wheel or sharp knife and pull triangles out a little to separate. Bake until golden brown, 12 to 14 minutes. Just before serving, scoop 1/2 cup ice cream into each goblet. Top with 2 tablespoons sauce, a scant 2 tablespoons pecans, and a wedge of pastry. Serve immediately. Sauce can be kept in the refrigerator at least a month, and pie wedges may be frozen for up to a month. I love mashed potatoes and meatloaf! Hands down, the whole family agrees. Chicken and homemade egg noodles over mashed potatoes. Don’t even talk about the carbs in this! One dish dinners are my favorite–I’d have to say my number one is definitely Shepherd’s Pie! roast chicken, mashed potatoes and stuffing – I love the dinner and I especially like the leftover chicken to turn into chicken mushroom pie the next day! I love to have Smothered Steak with mashed potatoes and fresh frozen corn for my Sunday dinner…and don’t forget the warm biscuits with butter and homeade strawberry jam! No need for dessert after all that! I saw the video for the sausage and white bean dish on Pam Anderson’s website…Please let me win the cookbook so that I can make it for my very own!!! I don’t necessarily have a favorite Sunday Supper. But I do have a favorite Sunday memory. Whenever we would go to my grandma’s house for the summer she would always take us to church with her. Every Sunday, on the way home from church, we would stop by Baskin Robbins and pick out ice cream for the week. We would always get ice cream right before bed. That was the best thing about Sundays! We would then go home and eat sandwiches for lunch then enjoy our ice cream! I just “liked” Three Many Cooks on Facebook. For the cooler weather, I love a warm, creamy pot of Corn Chowder with some crusty bread! Pot Rosat with roasted carrots and potatoes with luscious, buttery carmelized onions! Top it all off with a glass of apple cider! Yum! I love making pizza on Sundays!! :) Yum. I love a good roasted chicken with potatoes!! Just good food! I thought I already liked you on facebook but apparently I didn’t. So glad to now!! My favorite Sunday dinner is pot roast. When I’m going to be home all day, I’ll braise it and let it slow roast in the oven. Otherwise, it’s SUPER easy to do in the crockpot, too! Love a good Lasagna on Sunday nights with a big salad! My favorite Sunday supper is a PB&J, with a glass of coke and salt and vinger chips. Is it really “supper”, no but it is a great way to end the weekend. Being Puerto Rican my favorite Sunday Supper is a bit different but no less delicious. I was pretty lucky, my mom, dad and grandmas were / are all wonderful cooks. Been following Pam’s work for awhile, but didn’t know about Three Cooks on fcbk, so I am now an official devoted fan! I love roast, mashed potatoes and gravy, green beans w/ almonds, and hot dinner rolls for Sunday dinner. In the summer, we like to grill on Sunday. Either burgers and all the picnic side dishes, or a steak and baked potato. Our favorite fall Sunday dinner is homemade paninis and soup. I love the comfort of the simple food with wonderful flavors. pot roast or kalua pig in the slow cooker! I like Chicken & Dumplings. Favorite Sunday Meal, Fried chicken, potatoes and gravy, corn, biscuits and apple pie for dessert! Yum! Yum!! I love experimenting on Sunday’s, so for my Sunday Suppers are for new recipes. It’s the one day of the week that I have the time to try out new things! I like Sunday dinners to be something that fills the house with a delish smell that draws my family in to the table together. A roast seems to be the fav as of late. I thought I entered, but I don’t see my comment anywhere, so let me try again. I love Pam Anderson”s recipes… thanks for the opportunity to enter such a great giveaway. On Sunday, I love lasagna!! And the leftovers on Monday are great too!! This is my favorite Sunday Supper, especially when it’s cooler. Only 1 dish and 4 ingredients are used, 2 of those cans! Quick and easy but great nutrition and taste. Thank the world I remembered you had this sundae with pecans! I will let you know when I make it. Thank you for all your great recipes as well! I don’t have a specific Sunday dinner… I just like to try lots of new recipes that may take more time than an average week-night dinner. But some of my favorites are fajitas, chimichangas, or chicken pot pie.